Today we’re sharing our recipe for quick and easy pico de gallo which is perfect as an appetizer with chips or over top of this Mexican breakfast frittata. 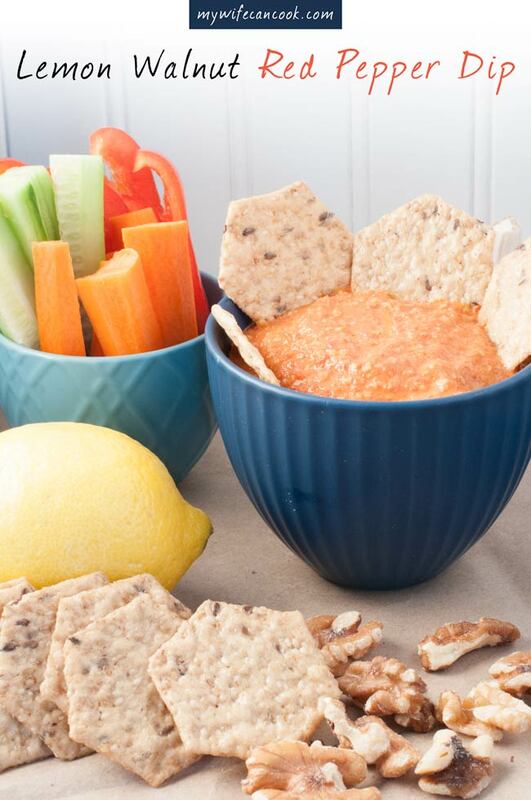 We’ll tell you what ingredients you’ll need, when to make it, and what else you can serve it with. 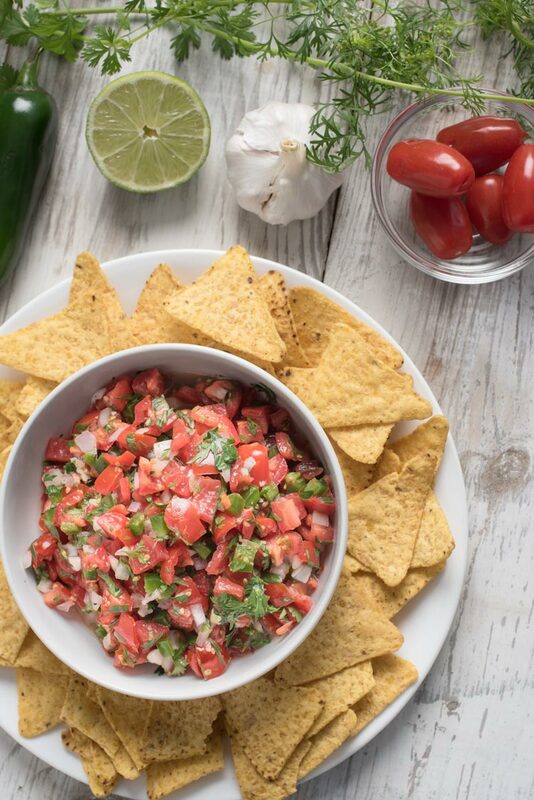 Pico de gallo is also known as salsa fresca and usually includes chopped tomato, onions, peppers, and key lime, but can take on other ingredients. And while you wouldn’t be wrong to refer to it as salsa, there are some subtle distinctions that set it apart. Salsa is often cooked while pico de gallo is always a mixture of fresh, unchopped ingredients. Remember that it’s also called salsa fresca? Salsa fresca translates to fresh salsa. So, all pico de gallo does, in fact, qualify as salsa, but not all salsa qualifies as pico de gallo. It is a distinct subset of salsa; It is uncooked salsa made with fresh ingredients. There are other subtle differences as well. Pico de gallo usually has fewer ingredients than many cooked salsas, contains less liquid, and has bigger chunks of ingredients. 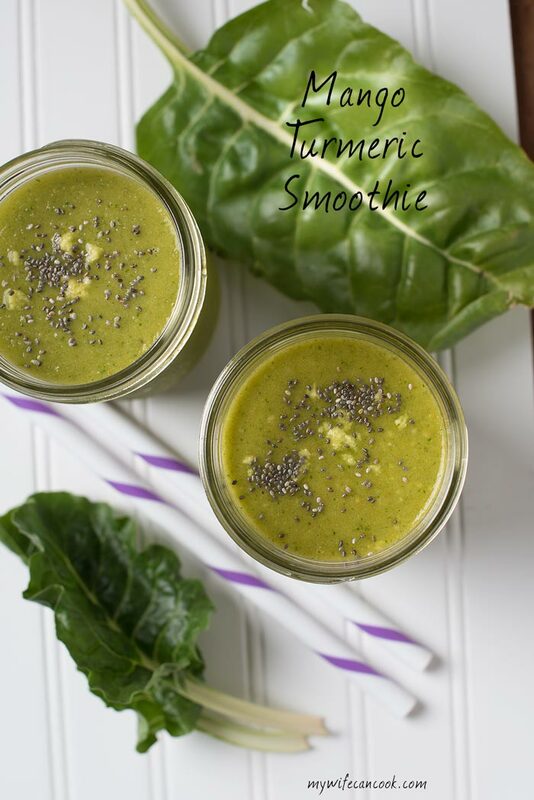 Think of a few fresh ingredients diced and stirred together. For a salsa, you are more likely to find the ingredients minced or even mixed to the point of being smooth. You wouldn’t find that with pico de gallo which is going to have big chunks of fresh ingredients. In our house, we love pico de gallo and salsa. We appreciate the many ways they can be enjoyed. In the summer, we love this peach salsa as a great cocktail hour appetizer. When we make tilapia fish tacos we’ll often make this mango salsa to go on top. And when we do make pico de gallo we love using it on Mexican Frittata. The decision to make pico de gallo always comes down to the availability of fresh ingredients. We made our latest batch in February after finding some great fresh mini marzano plum tomatoes at whole foods. Great tomatoes are a must! But this was actually a little rare for us as our local shopping options, sadly, in the winter often deliver those tomatoes that are less than red, less than ripe, and less than flavorful. If that’s the case, you might as well just buy a jar of salsa. 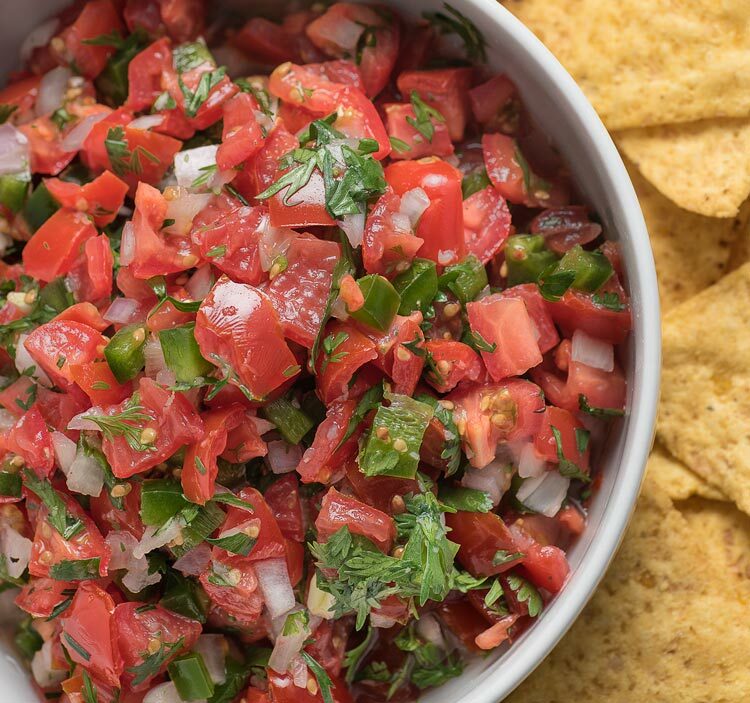 Don’t attempt pico de gallo without the right quality ingredients. Make sure you have the best fresh ingredients and then keep it simple! 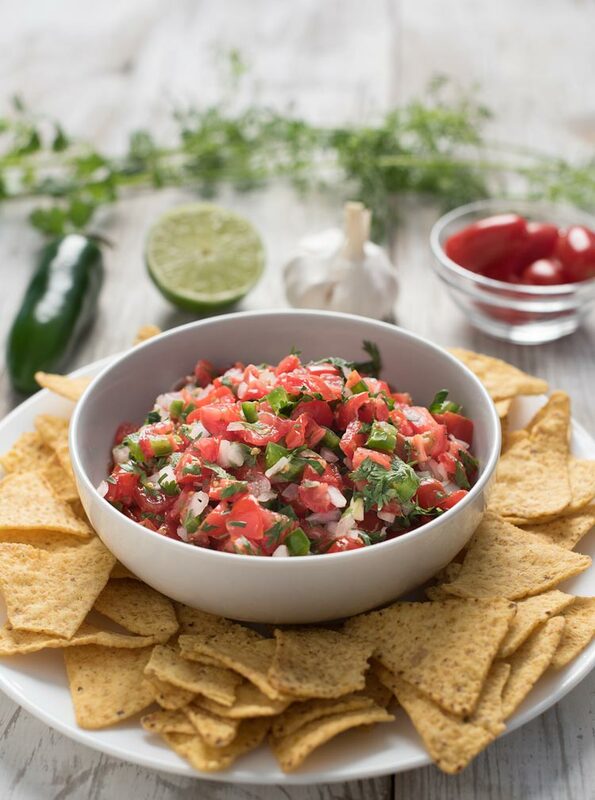 Our pico de gallo is only 6 ingredients: shallot, lime juice, jalapeno, cilantro, tomato, and salt. It’s basically just chopping and mixing, but we do like to soak the shallots in the lime juice to get rid of the bite raw onion tends to have. 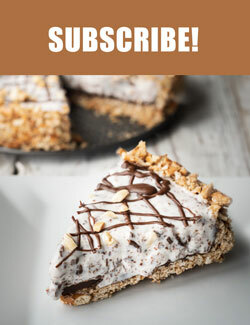 You can also add garlic, but I tend to skip it just because it can overpower the rest of the ingredients. 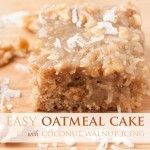 Not what you want, you want the ingredients to enhance each other. Another thing that sometime confuses people is understanding the difference between cilantro and coriander. In the United States, the leaves and the stalks of the plant are referred to as cilantro (what we use in our pico de gallo), but the seeds are referred to as coriander. However, this distinction doesn’t exist everywhere. In the United Kingdom it all gets referred to as coriander and you won’t hear the term “cilantro”. So maybe that helps clear up the confusion for you, but if you want even more detail delishably goes even further to clear up the coriander cilantro confusion. 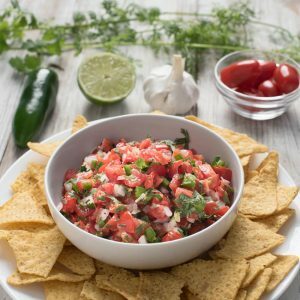 The biggest takeaway is just to pay close attention to your ingredients if you want to make a truly delicious and authentic pico de gallo. We tend to make it most often in the summer when fresh ripe tomatoes are plentiful in our garden. And then the fun begins. 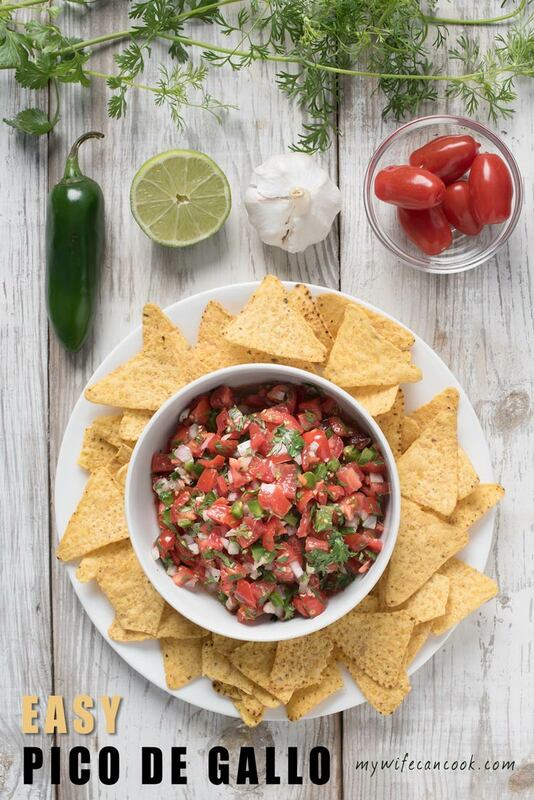 There are so many ways that pico de gallo can be enjoyed. 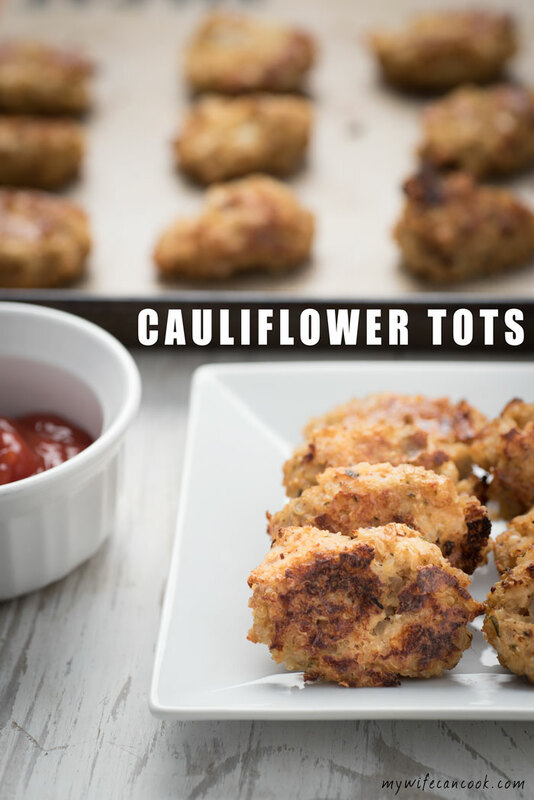 It works great alone as an appetizer, but we also love it atop breakfast frittata, on tacos, or atop other entrees. In what ways do you enjoy it? Soak shallot in lime juice for approximately 10 minutes before adding other ingredients. Drain tomatoes in a small sieve or collander. Add all ingredients to shallot/lime juice mixture and gently stir.